The Co Tyrone and Co Fermanagh beef and sheep stock judging heats were held on Tuesday, June 20th at Enniskillen Mart. The judges were William Wilson, Robert McCay, Trevor Armstrong, John Blackburn, Bob Matthewson, Kenny Preston, Alan Crockett and Gareth Sloan. The YFCU would like to take this opportunity to thank the judges for their time and expertise and thank Enniskillen Mart for hosting this event. 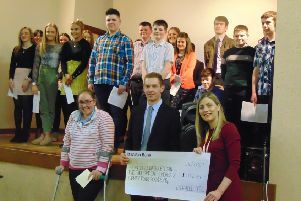 Thanks also go to sponsor Ulster Bank and the representative from Ulster Bank, Ciaran Cassidy who attended on the night. The top competitors from each age group will go through to the Northern Ireland final which will be held on Thursday, July 6th in Greenmount.